DemoCurmudgeon: Republicans claim Walker Rigged Elections...big surprise. Republicans claim Walker Rigged Elections...big surprise. Republicans say they're the party that defends against voter fraud. It's all about the integrity of our elections. But what happens when those same Republicans accuse fellow Republicans like Gov. 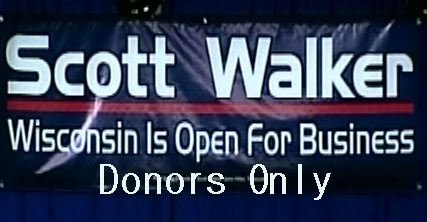 Scott Walker of cheating, election fraud? Crickets from the "stand with Walker" trolls?? In a column released earlier this week, conservative political consultant Roger Stone said there are strong indications Walker and Republican National Committee Chairman Reince Priebus rigged as many as five election in Wisconsin…including the recall election that targeted Walker. Stone based the claim in part on a study done by a voting statistics expert, which compared actual election results to exit polling. Walker did not offer any further comment. Stone is a former advisor to Republican presidential candidate Donald Trump’s campaign.